A journey to the North Pole now includes selfies, ‘elf-ray’ vision and a passport. In a bid for more customers and ultimately more sales, shopping malls and retailers are making holiday shopping an interactive and virtual experience, including the trip to see Santa. At least three companies have built virtual experiences for malls for the holidays, including DreamWorks, featuring Disney characters Shrek and Donkey taking kids to the North Pole in eight malls and another at 10 Taubman malls around the Disney hit Frozen. Mall operator Macerich has a virtual Santa HQ in conjunction with HGTV in 10 locations. Retailers are also introducing more interactive technology, usually with an aim of making shopping easier, more fun and more helpful. Target has an app for its toy catalog built on its gift registry system that allows kids to discover products in game-like fashion and add them to their wish lists. The list can be shared on social media or via email with family, and can also be accessed through Target’s in-store registry kiosks. Alternately, another feature lets kids hold an iPad over Target’s physical toy catalog, making the pages appear 3D and revealing more product information. Macy’s launched a function in its app last week called Image Search, which allows users to take a picture of an outfit they like or even a fabric or wallpaper pattern and then suggests similar items from Macy’s inventory. Sounds like fun, but interactive experiences are new technology with an old school motive: make more money in a highly competitive industry that continues to offer consumers more places and ways to spend. “Though it may delight you and entertain you and you might not buy anything, the real objective is to get you to buy more or buy something,” says Alison Paul, retail sector leader at consultant Deloitte. Interactive technology began popping up in stores several ago, including touchscreens that provide product information, tutorials or even let you adjust the lighting in dressing rooms. But this holiday season, those experiences and services are becoming more widespread as retailers try to stand out from competitors. The trend is borne from a growing need to keep shoppers engaged in more than just looking for products. Consumers want to be entertained, says Kathleen Jordan, a leader in the retail practice group of design and architecture firm Gensler. Retailers and malls are suffering from declines in foot traffic as shoppers shift attention to the Web and mobile phones While malls will remain a popular shopping destination over Thanksgiving weekend, consumers plan to visit less often over the course of the holiday season, according to a Deloitte’s holiday survey of more than 5,000 people. Meanwhile more than two-thirds of Americans now own a smartphone, and 72% plan to use it in holiday shopping; for 27%, that means spending more, Deloitte’s survey found. Using phones as a shopping tool also means many consumers “have a pretty good idea of what they want before they ever walk through the door,” says Jesse Tron, spokesperson for the International Council of Shopping Centers, making it even more imperative to give them other reasons to be at a mall. 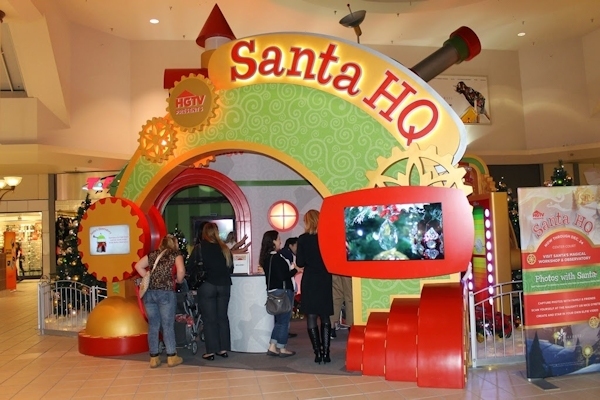 Macerich’s Santa HQ takes families through three rooms before they reach Santa himself. Kids stand on a platform that determines how good they’ve been, and flashes their names on large digital naughty or nice boards. They can take selfies that are superimposed on cartoon dancing elves in a video that they can then email to themselves. Tablets dubbed with a technology called “elf-ray vision” creates augmented reality – through the tablet a painted door on a wall appears to open to reveal a room full of elves and presents. The experience also aims to make visiting Santa easier on parents. Signs around the area instruct parents to text for reserved time slots instead of having to wait in line. Texting technology extends throughout Macerich’s Tysons Corner Center mall in suburban Washington, D.C. Visitors can text a concierge to find out about parking spots to the calories in a Cinnabon treat. The mall is also promoting its texting service as a way to receive holiday gift ideas and arrange for shopping bags to be delivered to consumers’ homes. Going beyond the entertainment factor and making technology helpful is crucial to successfully integrating digital experiences in stores, Jordan says. At Target, which is also partnering with a 3D printing company to offer customizable products to shoppers, interactive technology and design partnerships are meant to make it easier to shop with the devices customers are already living their life with, Goldberger says.